As a yoga teacher, integrative health coach, and executive assistant, I'm constantly exposed to both the wellness world and the office world, which has been eye-opening. Every day I see people unable to manage their stress or pain because they don't have the time and energy to do so—and I've realized that there's a huge gap between knowing the techniques and being able to implement them when you need them. This inspired me to create my own in-office techniques that deliver quick yet effective healing for people who are, well, really busy. One of the pains that I hear about most often in the office is headaches and migraines (specifically tension headaches). It makes sense—most of us stare at screens all day, both for work and for personal use. But pain doesn't have to be our only option. Here's how you can relieve a tension headache in less than five minutes. Start with a peppermint oil breathing mask. In my experience, peppermint oil is a miracle worker. It's one essential oil that I always keep on my desk, especially since it's great for tension headaches. Peppermint oil contains menthol, which can help release muscle tension and pain. It's also been shown to have clarifying and uplifting qualities—perfect for when you're feeling foggy. Note: Peppermint oil is best used on skin with a carrier oil, like almond oil. However, if you don't have a carrier oil, that's completely fine. Just use minimal amounts and tread lightly, avoiding any eye contact. Place a 2 to 3 droplets of peppermint oil in the palm of your hand. Gently rub your palms together, then cup your hands in the shape of a bowl. Exhale all of the air out of your nose, raise your palms about 3 inches in front of your face, close your eyes, and inhale deeply through your nose. Lower your palms as you exhale. Keeping the eyes closed, repeat this breathing pattern until you feel some relief. After you complete the breathing mask, try applying pressure to different areas of your skull, namely your temples. I recommend going light on the peppermint oil for this exercise; to get the perfect amount, gently touch your middle and pointer finger to your palms after doing the peppermint breathing mask technique. Take your pointer and middle finger to the temples of your forehead. Apply medium pressure and draw circles in a backward motion. Then work your fingers straight back through your hair along your scalp until they meet behind your head, back of the skull. Wrap your hair between your fingers and gently pull your hair behind you away from your head, keeping the hands close to the scalp. Run your hands down the back of your head, your neck, along the collarbones, and out through the shoulders. Repeat as many times as feels good. Breathing visualization is a technique I learned from an energy healer in New Orleans. I use it when I'm doing difficult hip work on yoga classes, but it can also provide relief for headaches or any type of sharp pain. By visualizing your breath, you'll allow more oxygen into your body and relieve tension by focusing your mind. It may sound too good to be true, but we know how important and effective breathwork is, and this technique isn't too far off. Start by closing your eyes and getting a very clear understanding of where the pain is in your head. Once you can see the location of the pain, imagine drawing a circle around it. With your eyes closed, inhale and visualize a thin white stream of air moving directly into that circle. Watch the white color as it fills the circle of pain. As you exhale, visualize a thin red stream of air leaving the circle, moving out through your nose, and dissipating in the space in front of you. Repeat 5 to 10 times, or until you feel a change in the sensation of pain. 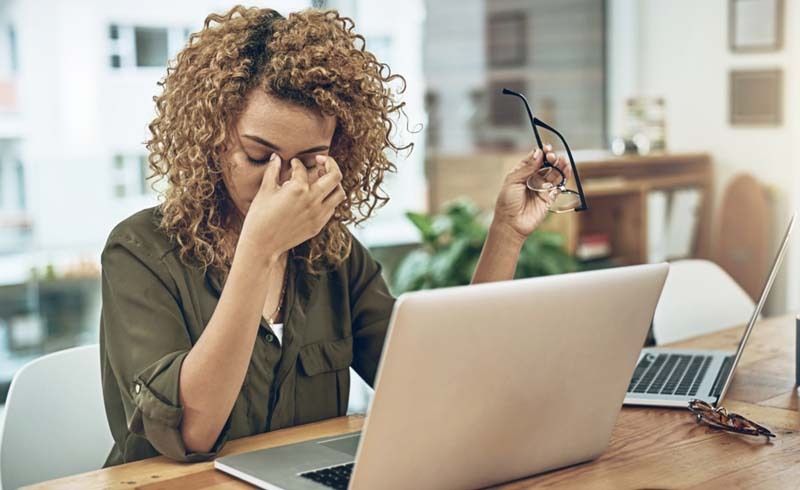 While it can be tempting to ignore your body's signals and keep working, taking a few minutes to relieve your pain or ease your stress can change your day, mood, and even increase your productivity. Why work through pain when you can work it out instead, right?